When I was a kid, I built things with my hands. Clay, wood, paper, tape, wire, and film combined together were enough to make a movie. If you had a motion picture or still camera, you could forge the materials of this world into worlds of imagination. I would draw cartoons, and animate them with pages of typing paper, colorize black and white photos with an airbrush, and manually layout pages for offset printing or silk screened shirts. Now I use a computer, on which I spend all day rearranging electrons, which are eventually illuminated by photons, but which may disappear with the wave of a magnet or random neutrino. Making things that are not physically real takes a lot of my time, and is mentally exhausting. To relax and expand my mind (in those very rare times in-between jobs) I build things I need in real life. All the desks my family uses are my designs. It is refreshing to build a skill, while creating something with my hands again. Admittedly the level of finish has improved over time as my skills have grown, but everything is functional and practical. Designing and building them myself is cathartic, and they are also unique creations of my own. I am an artist, after all, building is what I do. Recently I took opportunity of a short break and built a floor mat. Sure, there are many plastic, glass, and wood chair mattes on the market, but most of them function poorly, or are very expensive. 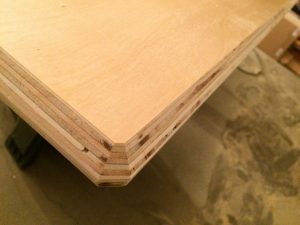 I looked online for ideas, and found other people manufacturing their own out of floor paneling, and other materials, but thought the designs too bulky. 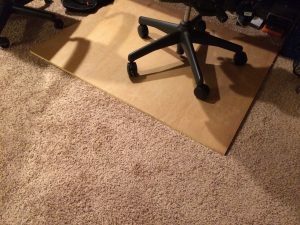 I wanted a hard wood floor, smooth, low-profile, and appealing without ripping up my carpet and installing one, so I made one out of a single 4 x 8 foot sheet of birch plywood, and am very happy with the result. I know. 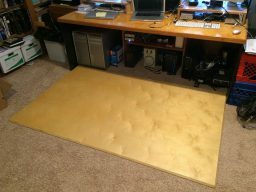 It is just a stupid floor mat, but I needed one, and the temporary wood panel I used to test the concept looked bad. It became a design challenge to make it aesthetically pleasing. However, I write a VFX blog mostly, and one might wonder how this fits in. Simple. I want every one of you to put down the computer mouse, pick up some tools, and reconnect with the real world, and am using my example of it to hopefully motivate you. Here is what I did, and I am inviting you to join me, and build something with your hands. My initial plan was to use a large, rounded routing bit along the edges of a plywood panel. 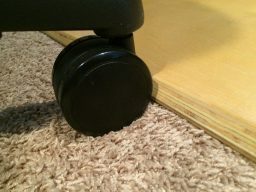 This would make the floor look nice, but also allow my chairs to have a smooth transition to floor — just in case I roll off. Since my desk is the size of a door (because it can be taken in and out of an apartment or home that way), the size of the panel allows me to roll back and forth. It also had to be very smooth and tough. Since my next job was coming up soon, I chose finishes that would not take a long time to dry, and kept the design simple. I chose a large 3/4 inch plywood sheet (that is the measurement before it is ground down, I think) covered in birch veneer from the local Home Depot store – with a pre-fab smooth finish (just to get me started). I preferred a panel with many thin layers glued together to fight against natural curvature of the wood, and minimize gaps in-between layers as much as possible. I picked up some water-based, oil-modified polyurethane finish for the surface, and various grades of sandpaper. The birch panel was more expensive than other types of wood, but it is intended for furniture and flooring due to its density. The Home Depot will cut lumber down for customers, and I had them trim it down by one foot on-the-spot. This provided me with a board I could test cuts and finishes on as well. The testing board was very useful, as I practiced with my router. In the process I discovered the chamfer bit. It cuts at a 45 degree angle, beveling the surface shallower than the rounding bit. I was able to use it on the board to bevel the corners as well — giving the whole panel a slight CGI feel, which is aesthetically appealing, and wholly appropriate for this desk setup. I used a square power sander and 180-grit sandpaper to buff the pre-finished surface, and a sanding block to smooth out the edges. I filled any gaps in the side of the plywood with plastic wood, and sanded that smooth. During the cut and routing phase, some of the paper-thin veneer lifted off. Unfortunately there was little I could do, other than sand those areas as smooth as possible, and hope it would not mar the finished look. Luckily there were no major gaps, and the sanding worked fairly well. One type of spray varnish attracted bugs. I guess that’s what they are stuck in amber. Once the surface was cleaned and dust free (wear a mask during sanding), I used paintbrushes to apply the first coat of polyurethane. I painted against the grain, and while wet pulled all of the strokes in the matching direction of the wood. This filled in holes, and then reaffirmed the natural wood structure. (Being a VFX compositing artist has taught me to be very attentive to grain). When this layer dried, I used 220-grit sandpaper to smooth out the brush strokes, and cleaned up the dust. More coats of polyurethane, and sanding repeated three more times after that. Higher grade sandpapers, 800, and 1500 were used to fully smooth out the surface before I finished off the whole panel with two coats of spray urethane. These last two layers were sanded with 1500 grit sandpaper between coats, and finalized with a steel wool sanding pad. 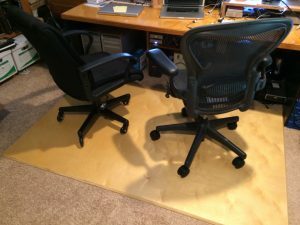 I have a new chair mat for my freelance VFX studio that I built with my hands, (all my fingers are accounted for) and am extremely happy with the final project. I did not anticipate one reaction to the new furniture: the tactile response. 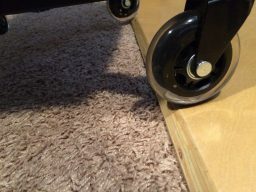 It is smooth under the feet, and rolling your foot over the edge has the reassuring feeling you get from a well designed product in your hands. 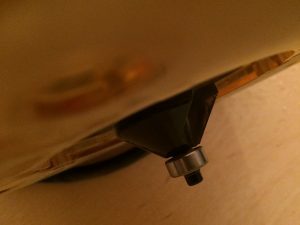 The tactile feedback provides an unspoken connection to the surface that is hard to put into words. I would say the best description would be that it is soothing, but also very satisfying as my own work of art. Visual effects is a very demanding career, and is far more relegated to digital work at a monitor than it used to be. The current zeitgeist pulling VFX toward practical effects is a cry from inside us to have some connection with reality. It is reassuring when the ground you stand on pushes back, whether physically or metaphorically, and is less reassuring when it is shaken. Your digital work may stand the test of time, or may be lost in a random electrical surge. If you build something with your hands, you educate yourself about the physical world you are simulating, reconnect to it, and perhaps leave a product that could outlast you. Get off the chair. Pick up some tools. Relax and build something with your hands. As for me, I am going back to work.